Dreaming of a kitchen renovation? 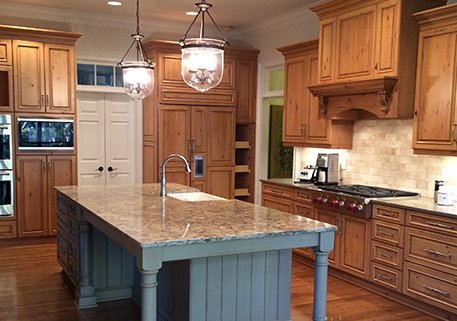 "The Atlanta kitchen remodeling and custom cabinet specialists at Berkeley Woodworking, Inc. can make your dreams a reality"
Berkeley Woodworking Inc. is dedicated to helping clients design and create their new dream kitchen. The Atlanta kitchen renovation and design specialists at Berkeley have been perfecting luxury residential cabinetry for 38 years, incorporating the latest innovations, finest American woods, and most durable finishes. Our professional designers, craftsmen, and installers work seamlessly to create kitchens that are as beautiful as they are functional. Whether you are planning a renovation project or building a new home, we listen carefully to what our customers want and will help guide you through the complete process of designing cabinets for rooms to reflect your lifestyle and your personal taste. Our state-of-the-art equipment, combined with traditional building and finishing techniques, results in custom cabinetry that is as durable as it is beautifully pleasing. Whether you are looking for traditional, contemporary, modern, or transitional cabinetry, Berkeley is the right choice for you. Kitchens are our passion, along with our custom cabinets we also offer complete kitchen renovations, this saves you time and the convenience of working with one company throughout the entire project. At Berkeley Woodworking, Inc., we are a full turnkey company that designs and manufactures all cabinets locally within our state-of-the-art facility in Norcross, Georgia. Our own skilled cabinet makers, install the cabinetry, not a subcontractor. Berkeley’s efficient organizational skills are displayed at every level, from planning and performing the work, to maintaining a clean job site and completing the job on time or earlier. We understand that undergoing a kitchen remodel project in your home is inconvenient; therefore, we have a well-organized schedule to minimize your downtime. Our jobs are run efficiently, and many of our projects are completed within only a few weeks. Clients are consistently amazed at how smoothly we complete their jobs. Over our history of 38 years in business, we have a proven track record of success with thousands of happy customers, and we would love for you to be one of them! We invite you to call and speak with one of our design specialists about your project and to schedule a visit to see our beautiful kitchen and bath showroom. Schedule an appointment today to visit our showroom and see our beautiful kitchen and bath designs.